B-Line Trauma is a Legendary primary scout rifle. This weapon is purchasable from the Crucible Quartermaster, and can also be rewarded randomly. The good: Highest rate of fire, large magazine. The bad: Lowest Impact & range, slowest reload speed. Conclusion: Default perks are subpar. Reduces the severity of this weapon’s recoil. Accuracy increases over time, up to 20% by the end of the magazine. 5% chance to regain a round into the magazine per shot. 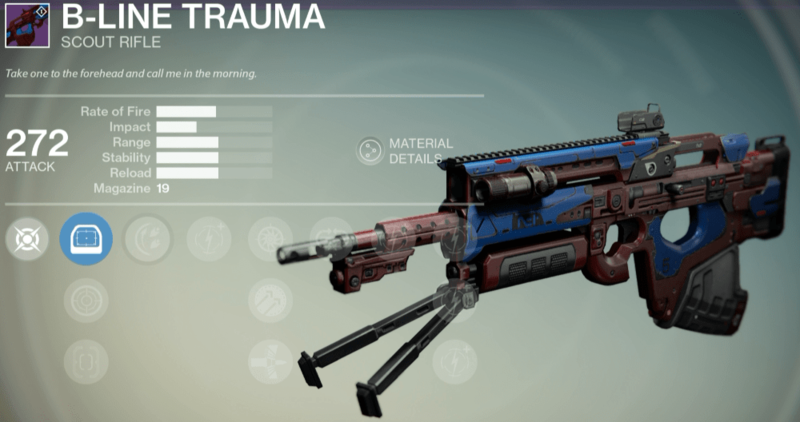 B-Line Trauma is a Legendary primary scout rifle which can be purchased from the Crucible Quartermaster for 150 Crucible Marks. The default perks are listed above, but these can vary if you receive this weapon from an Engram or as a random reward in PvE/PvP. Click here to see all of its potential perks. For those who desire a close range weapon that can be fired very rapidly, use B-Line Trauma. Its base stats almost match those of Dead Orbit’s Crypt Dweller SR1, and its large magazine size matches Vision of Confluence. Rate of fire is where B-Line Trauma excels. It’s currently got the highest rate of fire of any Legendary scout rifle. You can unload a full 19 round magazine in just 4.5 seconds. This high rate of fire makes this an excellent choice for PvP and even in PvE for the ability stagger enemies quickly. You’ll be able to mimic SUROS Regime‘s Focused Fire if you pull the trigger as fast as possible. The stability sits comfortably in the middle of the Legendary scout rifles. It’s recommended that the default RED DOT-ORES sight upgrade is equipped for maximum stability. Ranged Lens RLR5 will give the best range, and Quickdraw IS will provide the best reload speed, but the cost to stability just isn’t worth it. While some may not appreciate aim assistance, this weapon tops the scout rifle charts. Aim assistance will help your bullets find the target, essentially making it easier to land shots. Rodeo and Hammer Forged work well together, increasing stability and range. Hammer Forged is needed since the base range is so low (more on that below). In PvE you’ll probably benefit most from Armor Piercing Rounds. Unlike sniper rifles with APR, you’ll be unable to shoot through walls, but APR is invaluable in situations where enemies are close together (Crota’s End). As you’d expect with this archetype, since you’re able to fire so rapidly, Impact suffers greatly. This scout rifle has the lowest Impact. In PvP you’ll be able to dish out 29 damage to the body and 43 to the head, which equates to 5-7 shots to take down your opponent. While it does take slightly more shots than most scout rifles, the shots can be fired much quicker, so it makes up for the low damage. As mentioned above, the range is also extremely low – the lowest of all Legendary scout rifles. Hammer Forged will significantly increase it though so it’s definitely worth using on larger maps. Unfortunately this weapon also has the slowest base reload speed, and can only be quickened using Quickdraw IS. The base reload speed is 2.6 seconds but Quickdraw IS will reduce it to 2.3 seconds. If you’ve used Gheleon’s Demise or Badger CCL, you may be used to the slow reload speeds that some scout rifles have. The Saterienne Rapier (full review) on the other hand is much quicker. Easily the worst aspect of B-Line Trauma is Mulligan. It plagues a few of the vendor weapons such as Against All Odds (full review); it’s only got a 5% chance to return ammo so it’s basically a wasted perk. It can occasionally save you from a reload, and you may earn an extra round every now and again, but not often enough. With its fast rate of fire and low recoil, B-Line Trauma allows for rapid, accurate fire at medium ranges. 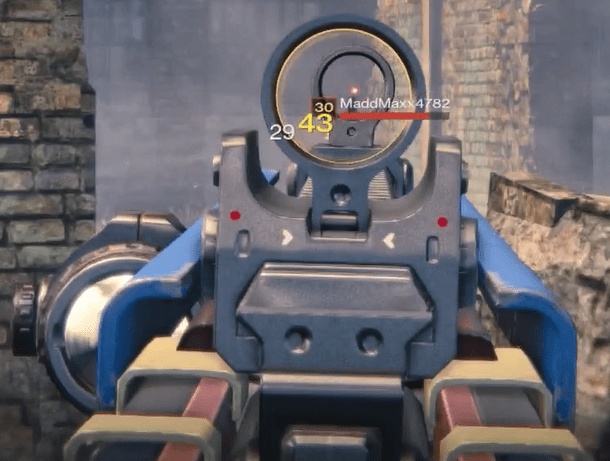 Unlike heavy scout rifles, missed shots are not penalized as much with the relatively high magazine size. It is very forgiving with little-to-no delay between trigger pulls unlike most other scout rifles. In the Crucible this means that you can easily use the B-Line to compete against most auto rifles at mid range, especially if you have a fast trigger finger. In PvE, this allows you to keep a target’s shields down and enables you to track and hit a moving target much more easily than if you were using a heavy scout rifle. While the damage is acceptable for use in the Crucible, especially if you can land consistent headshots, the lack of damage is very noticeable in PvE. Is B-Line Trauma better than The Saterienne Rapier for PvE? Nope. Is B-Line Trauma better than Another NitC for PvP? Arguably not. It does hold its own due to the insane rate of fire, but there’s really nothing special about the vendor perks. For PvP this weapon earns a 8.2/10 and for PvE a 7.8/10.